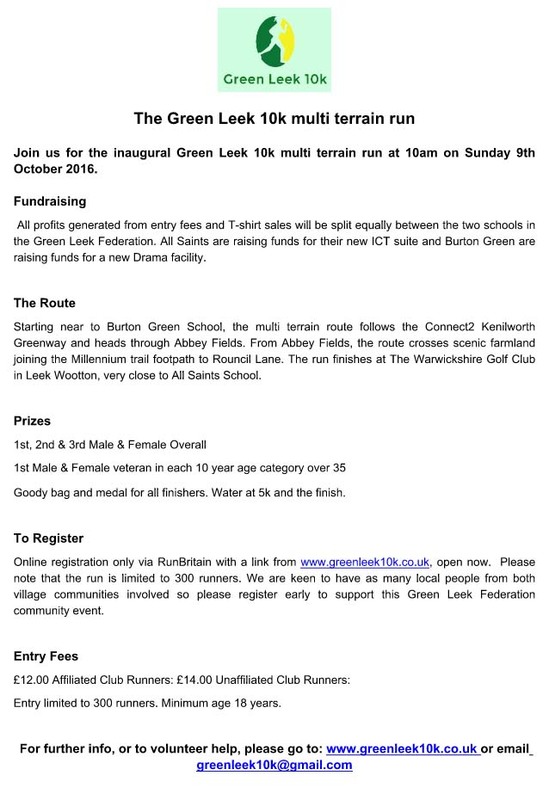 A group of parents from Burton Green Primary school, together with colleagues at our partner school, All Saints in Leek Wootton, are organising a brand new running 10 kilometre running event. More than 250 runners have already signed up for the race. The minutes of the previous meeting of July 12th 2016 were approved. Joint letter about fly tipping. Rona would follow up the situation with Cllr John Whitehouse who had indicated it was a District Council matter. Rona would follow up with the Parish Council whether funding might be available for the full cost of Bugle printing throughout the year. Mary and Hilary had agreed to finalise collections in Red Lane but any help would be appreciated. Mary would approach Hickory's Smokehouse regarding Bugle sponsorship and/or sponsorship of flower tubs at an appropriate point. Walking group article would feature in a future edition of the Bugle. New treasurer: Diane Adams had volunteered her services and would be nominated at the AGM. Children in Need fundraising pack had been sent for by Hilary. Email to be sent to invited speakers. 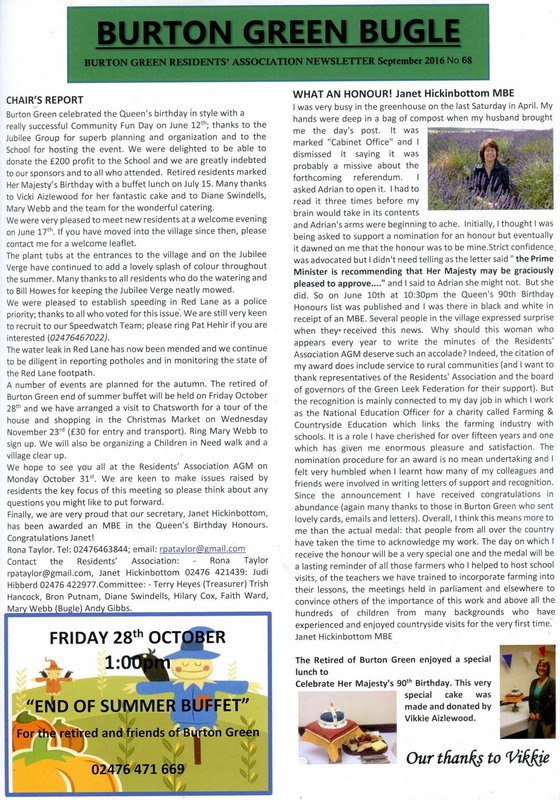 An invitation to submit questions for the AGM had been included in the Bugle. A card and flowers had been sent to Betty Woodward and the committee was pleased she was now much better. A request for financial contributions towards refreshments would be displayed at the AGM. Hilary had rung Peter Hallam about the footpath in Red Lane which had now been cleared. All other matters arising has been covered or were to be agenda items. Terry said there was not a lot to report as things had been quiet over the holiday period. There had been very few transactions. 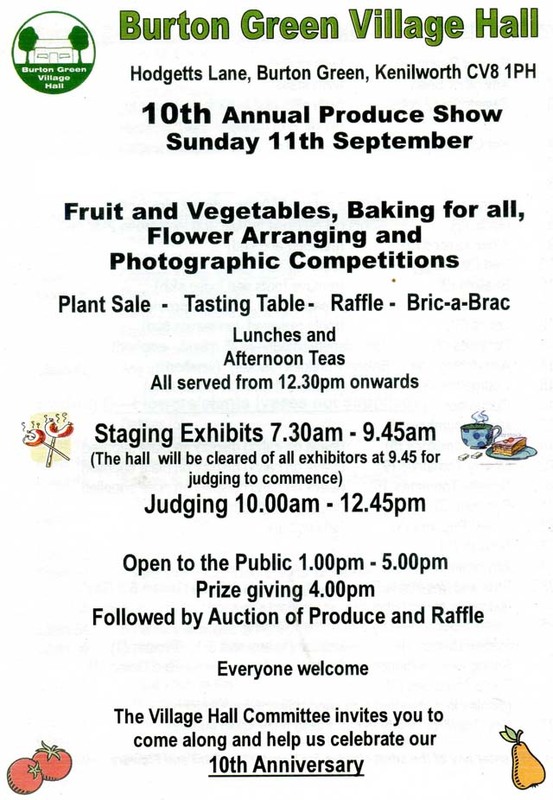 The remaining £100 sponsorship from the most recent Jubilee Group event was being earmarked for framing of village mapsto go to the new Village Hall. Subscriptions collected so far amounted to approximately £750 which was on a par with the same date in previous years. This was about three quarters of the final amount anticipated. Funding for Speedwatch calibration: costs had risen significantly from £238p.a. to £298p.a. but this increase had been incorporated into funding applications. The ParishCouncil had a meeting the following week and it was hoped a favourable decision would be reached to fund 50% of the costs. The Kenilworth Forum would also be deciding the following week which applications would go forward for consideration. Terry's BGRA Grant Policy was agreed with minor amendments. Thanks were expressed to Terry for producing this document which set out BGRA Residents’ Association financial position and the fact it is not a grant-making body. Cllr Green asked about the status of the Jubilee Group. Terry explained it had begun as a separate and independent group but when it started doing large scale events which needed an initial financial outlay, it had been agreed the Jubilee Group should become a subcommittee of BGRA. The Jubilee group had to raise funds to support each event. Significant profits were usually made but events needed to break even if possible. Terry gave a comprehensive explanation of the Jubilee Group's finances overthe past few years. 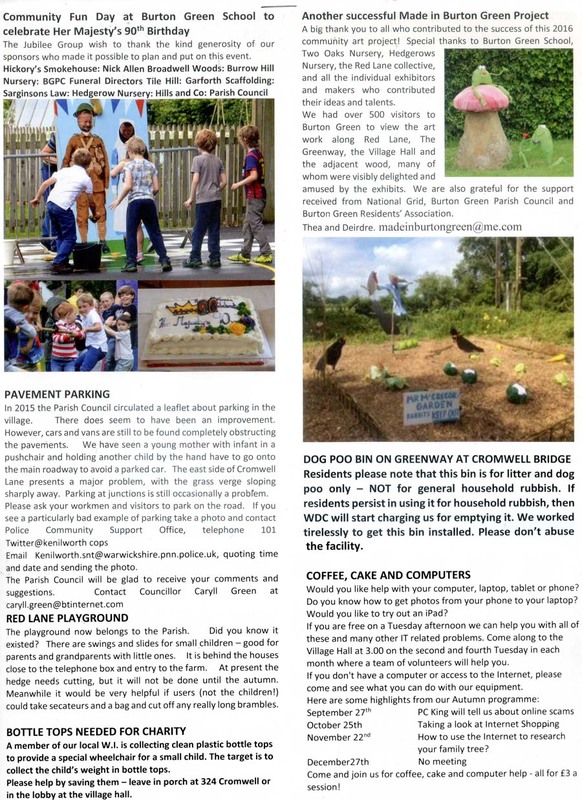 There was a request from residents at Broadwell Wood that they be fully informed about matters regarding the siting of the new Village Hall and car parking. The chair of the Village Hall committee was addressing this. Water pressure. Problems of water pressure persisted in certain parts of the village. Nick Hogue had gathered responses from residents about low water pressure and had collated these to send to Severn Trent.A response had been received which, although it indicated Severn Trent felt they wereproviding an above average service, they were willing to monitor the areas of specific concern and indeed the individual properties. They promised to install "loggers" at the most affected properties to see if they could identify the problems being experienced with a view to solving the issues. Thanks were extended to Nick. Overhanging tree.A resident had been concerned about a willow tree in the grounds of the Hickory’s Smokehouse which had been over growing the pavement and obscuring the view of motorists exiting the site. Once concerns had been relayed to the management, the matter had been dealt with promptly and the tree pruned. Retired of Burton Green lunchOctober 28th was scheduled as the date of the next Retired of Burton Green lunch. Any volunteers to help Mary and Diane would be welcome. Children in Need ramble, October 29th. This did not match the national date as the Green Leek Run was already taking place on that date. Chatsworth visit November 23rd. As yet there were not enough people booked on the visit. Money was not being banked until it was certain the visit would go ahead. To minimise outlay regarding wine and refreshments, Rona had agreed to put up a notice asking for donations. The formalities of the election were still needed but the committee was keen to make the event more inclusive and less a series of presentations. It was agreed the councillors would be invited to join us but rather than presenting reports they would be there to answer specific questions. A request for questions had been placed in the Bugle and the issues the committee felt would be of interest included: housing (response from PC); HS2 (Andy Gibbs); Village Hall (VH Chair); Traffic to include Speedwatch; Police Matters. Each response should last no more than three minutes. The petitions had not been successful. Theresa May, the new Prime Minister, was in favour of HS2. There was still great uncertainty about timing etc. Concerns about costs were resulting in cost cutting. Drilling rigs were in place locally to test the grounds. Cllr Green said PC had almost become owners of the playground in Red Lane. Some volunteers were to check it once a month for purposes of insurance. The PC was short of councillors and needed to co-opt more members as soon as possible. Cllrs Green and Vine looked at planning applications and felt the Planning Committee at the District Council was becoming stricter. Thanks were given to Cllr Green for her support at BGRA meetings. Mary was collecting information about wells in Burton Green for a history project. The next committee meeting would take place on November 15th 7.30p.m.at the Village Hall. Judi would sort out with Vic Stuthridge an early October 2017 date for the next AGM. Action: Judi. WDC has provided the following information on how representations concerning how the proposed local plan modifications have been dealt with. The Council has not made any individual responses to the representations received during the modifications, but did pass them all to the Inspector who is considering the soundness of the plan and its modifications. 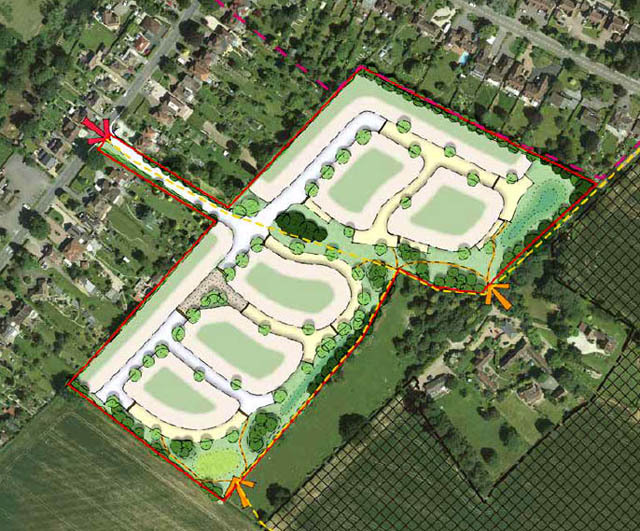 Representations concerning Westwood Heath are available to view here. The questions and concerns people raised will in turn have helped him draw up a list of detailed questions that will be addressed during the forthcoming local plan examination in public, which is due to start during the last week in September and which runs until December. A number of statements have now been produced by all parties interested in participating in the examination hearings. The statements are available to view on this page. Please scroll down to Written Statements – Resumed Hearings. 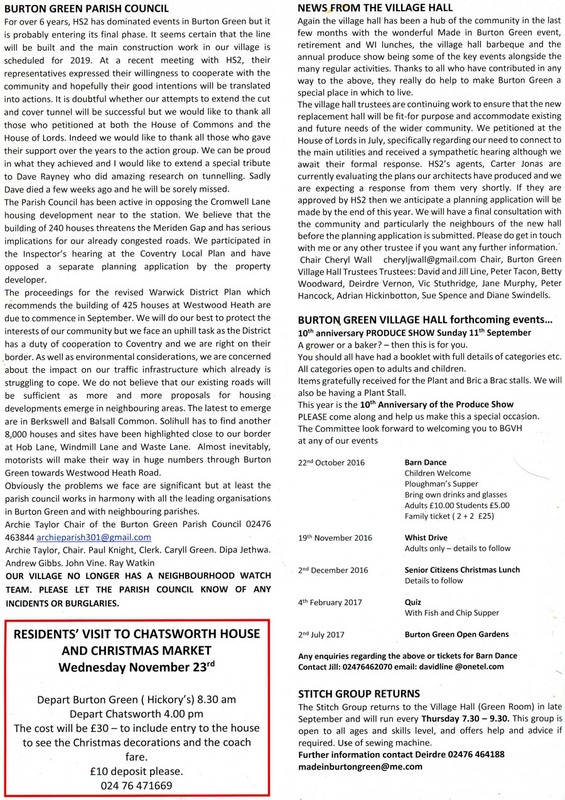 A number of written statements concerning the Westwood Heath site can be seen here. The former page also contains details of the hearing dates and times and the inspector’s matters and issues paper, containing the questions he has about various topics. There is an evidence base available to view for both the submitted plan and the modifications. The main evidence base page is here and the Local Plan examination evidence base page is here, which also contains the documents and evidence prepared for the proposed modifications. 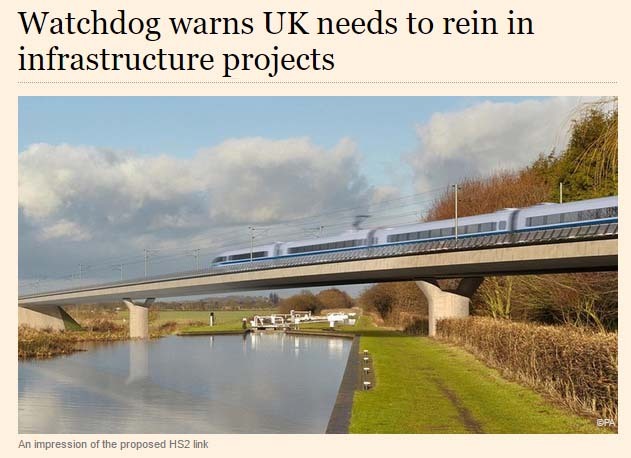 Chancellor of the Exchequer appears to rule out spending on big infrastructure projects. Britain's roads and railways are in line for a multi-billion pound boost to help cushion the impact of the Brexit vote. But any fiscal stimulus delivered by the Government would provide a “quick” boost to the economy, be “well designed” and “limited in duration”. Mr Hammond appeared to rule out spending on big intrastructure projects. Mr Hammond said "modest" projects would be more beneficial to the economy, citing the UK’s fiscal position and the lengthy time needed to start large projects. "Billions of pounds’ worth of public projects will have to be scrapped because of a tidal wave of pressures from an impending Brexit. The comptroller and auditor general of the National Audit Office, Sir Amyas Morse, said the government would have to treat leaving the EU as an emergency and that government departments would be forced to decide which plans could be cancelled or suspended. Major projects such as the Hinkley Point C nuclear plant, a third runway at Heathrow and the ambitious HS2 rail project would have to be reassessed as the government decides which can be done without. Ministerial ambition also made it hard for the government to think rationally about which projects were “must have” and which were “would like” and expendable, he said. We need to ask ourselves, can the public sector deliver Hinkley Point C, a third runway, HS2, a northern powerhouse, nuclear decommissioning, Trident renewal and restoration and renewal of the Palace of Westminster all at the same time? All these projects are drawing on the same pool of skills and many of these contain optimism bias that they will be able to meet their skill needs at an appropriate cost, he said, while declining to speculate on which should be scrapped." 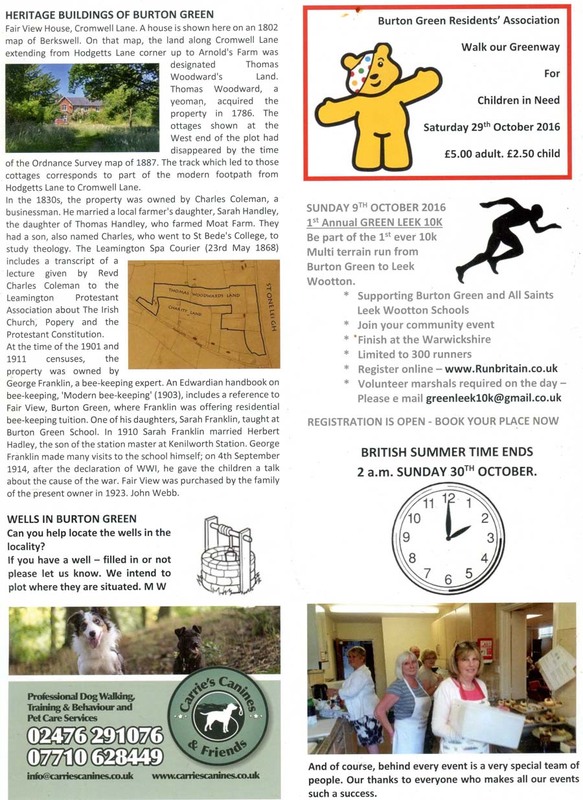 The September 2016 edition of the Bugle has been published.